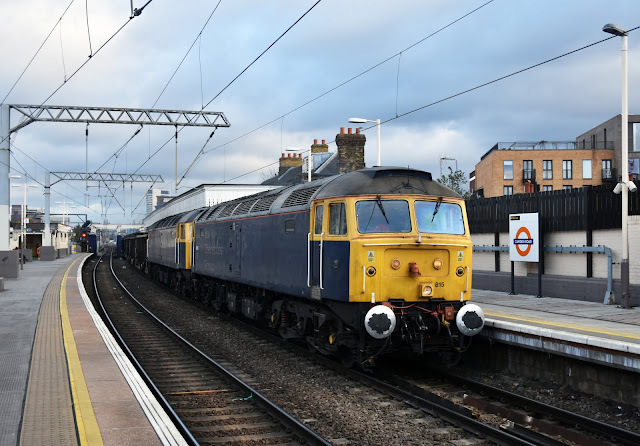 Opportunities to see class 47's on 'proper' freight trains in 2017 are few and far between- it is therefore no surprise that photographers have been out in force recently as GBRf have been using a pair of class 47's on spoil trains between Wembley and Barrington. The trains convey spoil from London which is deposited at the former Barrington Quarry site near Foxton where it is being used to restore the former chalk pits. Rail Operations Group have been contracted to supply traction to the train while there is reduced capacity in the GBRf fleet, however the heritage traction should only be a temporary measure. On 29th November 2017 47815 and 47848 pass Camden Road with the empty train, 6T02, heading back to Wembley. Class 56's have also appeared on recent workings to/from Barrington.